This family includes one genera and one species [Updated 20.09.09]. In 2009, Vignoli & Prendini transfered all troglomorphic species in Superstitioniidae to Typholochactidae Mitchell, 1971 (see Typhlocahctidae family file for more details). "Superstitionia" is named for the Superstition Mountains east of Phoenix, where the first specimens were collected by Herbert Stahnke (at "Don's Camp" as told by Herbert Stahnke to Kari McWest). Troglotayosicus was transfered into this family from the now abolished family Troglotayosicidae in a recent revision by Soleglad & Fet (2003) but I've now reinstated Troglotayosicidae and moved the genus back again (see Troglotayosicidae for more info). Only one species, Superstitionia donensis, has been reported to occur in captivity. 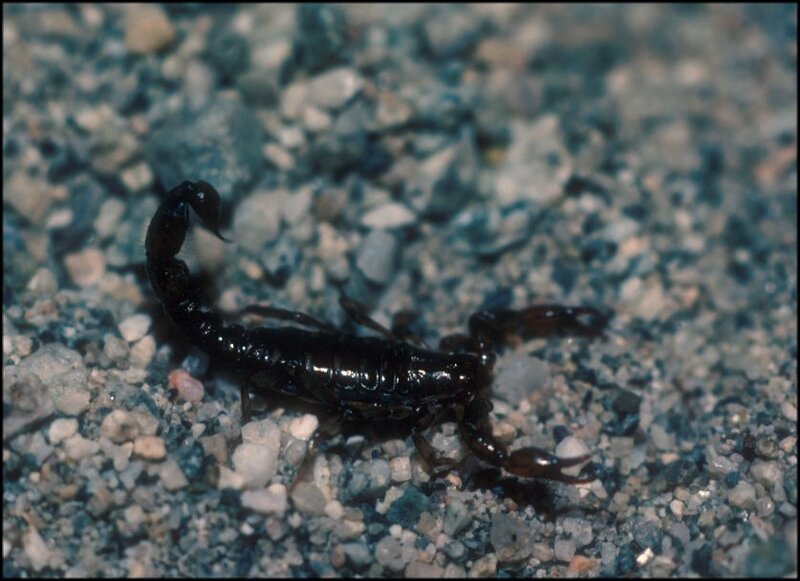 No data has been found about the venom of these scorpions, but, like S. donensis (McWest, pers. obs. ), they are probably harmless. Left: Superstitionia donensis photo by Dr. Graeme Lowe (C).